It’s a good and perfectly logical point: if the amount of calories you ingest is inferior to what you consume every day, you will lose weight regardless of your restaurant choice. And if you have a balanced diet, you will have all the nutrients you need no matter where you eat. So don’t blame McDonald’s. Blame yourself if you gain weight. 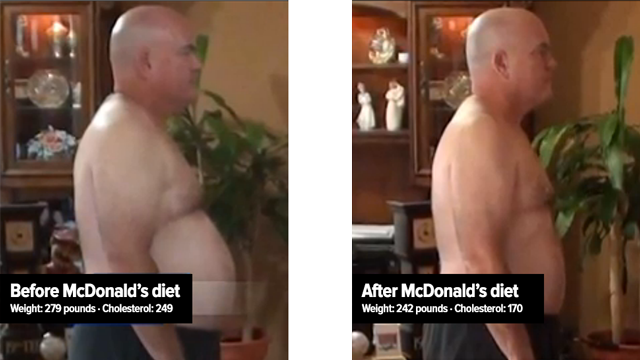 If you eat like a pig—like the Supersize Me guy—you will be fat like a pig no matter where you eat. This entry was posted in HEALTH and tagged health, macdonals, pounds, science.